A couple of days ago Marian brought home a copy of The Hunger Games, so I read it. For someone steeped in a lifetime of science fiction, it didn’t really strike me as anything special. Man, the ultimate prey! Fine. Still, I get that it’s a book for teenagers, and obviously they aren’t as jaded by the basic plot device as I am. No harm, no foul. 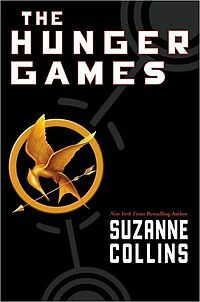 volume of Suzanne Collins’s The Hunger Games trilogy was published. ….Why have readers been so drawn to catastrophic futures when the present seems troubled enough? Why are young heroines thrust into ruined worlds and then routinely hunted, harassed, or beaten into unconsciousness?….While The Hunger Games begins in Appalachia, three more recent dystopias, Marie Lu’s Legend, Veronica Roth’s Divergent, and Moira Young’s Blood Red Road (all the first of trilogies, optioned by the likes of Ridley Scott and the producers of Twilight), rise up out of, respectively, Los Angeles, Chicago, and the American flatlands that have been reduced to a second Dust Bowl. In each case, the teenage-girl narrator has grown up sheltered in a zone of relative comfort. Her troubles multiply as society’s flaws are revealed to her and she must fight for survival and the safety of her family. It doesn’t actually surprise me all that much that teenage girls, a demographic practically defined by angst, would find these kinds of narratives appealing. If you think the world is heartless and authoritarian, what’s not to like about a fictional world where a teenage girl fights and beats an establishment that’s heartless and authoritarian? Seems like a natural. In any case, since I’m not a teenage girl, I think I’ll skip the rest of these books. Right now I just have to decide whether to bother reading the rest of the Hunger Games trilogy. Pros: it will only take a few hours and I’ll be acquainted with yet another segment of pop culture. Cons: Sort of obvious. Any advice from my readers? Should I bother with books two and three?